These tips will ensure your seeds will be kept safe for years at a time and still sprout when you decide to plant them. Once you’ve followed the tips in our article How to collect your own seeds, gathered the seeds from the garden and brought them indoors, there are a few steps you need to take to get them ready for storage. Not all seeds are readily visible and ready to store. For example, if you stored the intact seedheads of marigolds you collected, the seeds might not dry fully and eventually could rot. To get at the seeds, peel away the spent ray flowers (the colorful petallike parts) and you’ll find a mass of narrow seeds inside the receptacle. Gently pull them out. After you’ve extracted the seeds, there is a chance there’s still chaff or soil particles that might carry pathogens or pests and could infect next year’s crop. Use your fingers to pick out debris around larger seeds. A fine mesh sieve will hold larger particles and let smaller seeds fall through the holes into a bowl below. Clean the seeds as best you can before setting them out to dry. Once you’ve cleaned the seeds, pick through and discard ones that are a different color, misshapen or smaller than the rest. The largest ones usually grow to be the most vigorous seedlings. The next step is to set them out to dry. If you just have a few seeds, the open shallow bowls in the photo above work fine for small amounts. If you have large seeds or a large number of them, spread them out on a tray. Place them in a spot indoors out of direct sun, which can damage them, and leave them to dry for a week. The drying process induces dormancy and helps to preserve nutrients that are needed for germination. They store best with a moisture content of 5 to 8 percent; seeds that are dry enough will be hard so you can’t smash or bend them. If the moisture content of the seeds stays above 30 percent, they may germinate during storage or get moldy. Even at 10 or 15 percent, the seed’s food reserves can break down and be depleted. Place your seeds in a container that will prevent moisture and humidity from getting inside. Zip-close plastic storage bags and small glass baby food jars are good. Paper envelopes are fine, too, but they’re better for holding seeds for short-term storage, such as until the next growing season, because they aren’t air-tight. 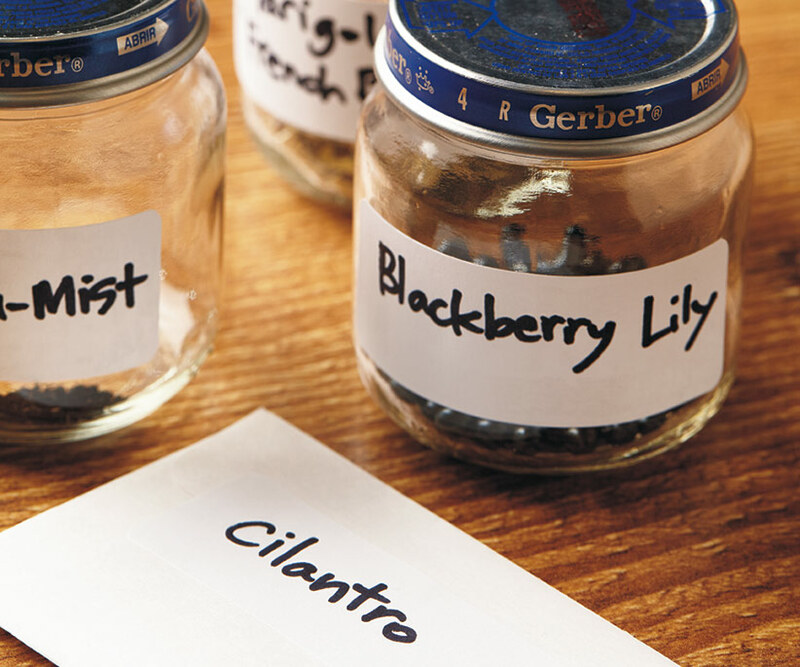 Even if you think you’ll remember which seeds you saved, it’s a good idea to label them before putting them away for several months. And when it comes time for planting, you’ll know what you have. 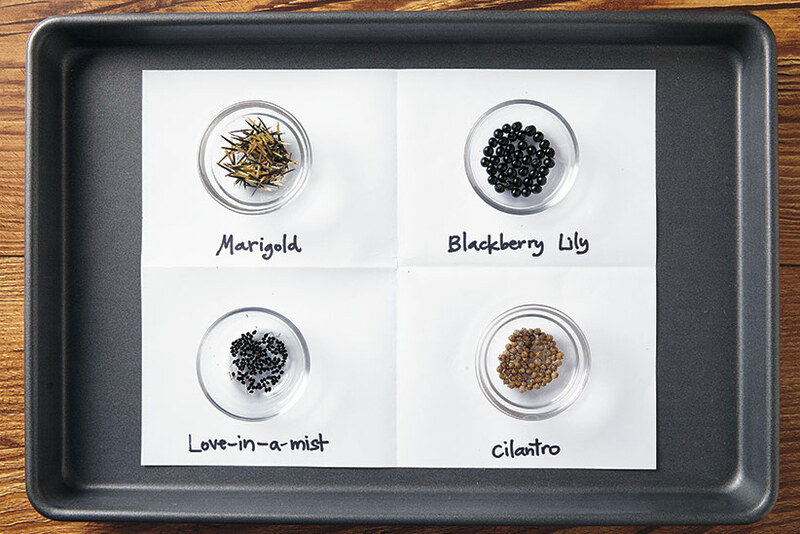 It’s also important if you’re saving many types of seeds, and especially different varieties of the same species. Write as much information as you need—species and variety, color, date and where you collected them. If you don’t get around to planting them next year, you’ll know how long they’ve been in storage. Keeping track of where plants were grown is helpful if you have more than one area where you collected seeds from the same type of plant. Once you grow them again, you may notice important trait differences. If you want to be really organized, create a spreadsheet to keep track of the information from year to year. Keep the seeds in a dark, dry location at 32 to 41 degrees F (like in the refrigerator) until you’re ready to plant. How many years they stay viable depends on the species, usually between two and five years, but sometimes longer. When it comes time to plant, start them indoors or outside, depending on their needs. 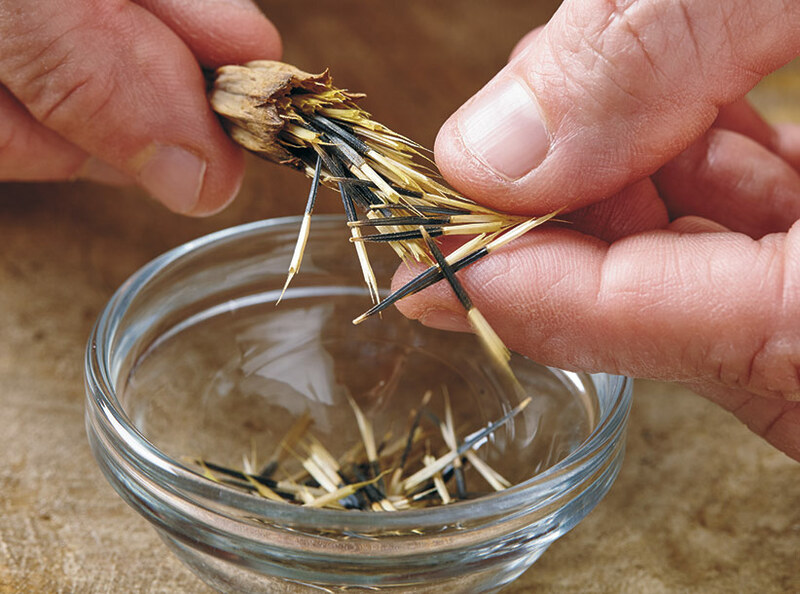 Now that you know how easy it is to collect and save seeds, it’ll be easy to have success!